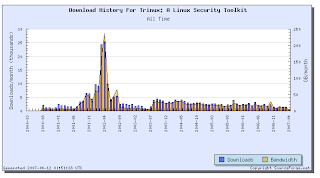 Although the trajectory is downward, I was shocked to monthly Trinux download statistics within the 1.5-3K/month range and even more frightening hit counts still in the 50-60k/month range. Who are these people? And what happened in March/April 2002? Death and Four Hours to Spare? Is there any reason to use Debian anymore? VMWare Fusion Beta 3 Out!